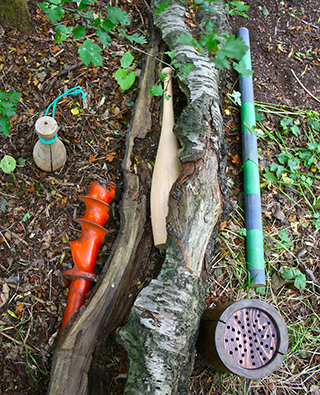 This year the Heartwood artists are returning to their home woodland at Monkquell. 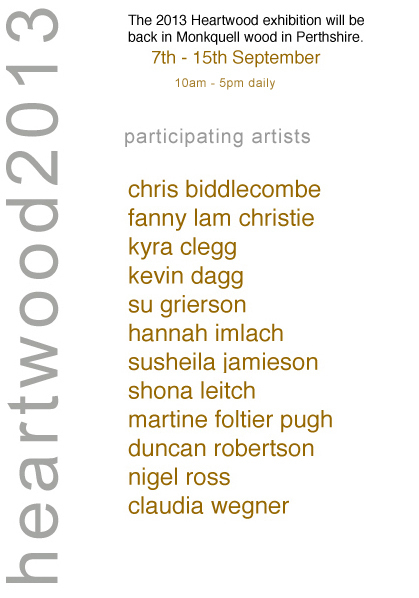 Five members of the Scottish based Heartwood artists have come together and invited seven guests to work in the same natural environment. The woods offer an invitation to explore, to reflect and to open up. Discovering a man-made dimension in such a scenic setting, reinforces the sense of wonder experienced by visitors on their woodland journey. Visiting the woods is not simply a journey of discovery; it is also a journey that spans the natural world and all that it means to be human. The artwork lies in between. Beyond the planted borders and mown grass, across the farmer’s field, where the ferns grow higher, the brambles denser and the tree canopy darker, begins the woodland. 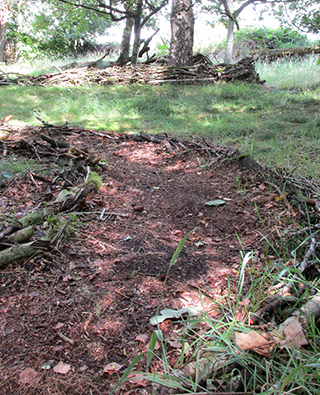 At the far side, where the deer run through, there is a small clearing and a fallen tree – one of many quiet spaces. Here, fauna genes are placed with flora genes, gifts are placed for the good neighbours, and an itinerant traveller has placed down his head for a passing moment. Science touches folklore, folklore touches woodcraft, and new stories appear.This work is very much about collecting, remaking and rearranging. As an artist Chris listens to curious logic and lateral whispers, to then go on to create believable fictions. Chris is an artist based in Glasgow, with a history of making work in the form of site specific interventions using a variety of techniques that create ambiguous dialogues with the viewer using cultural, historical or social references. His mixed media installations have been exhibited in the UK and internationally, encouraging genuine collaborations with architects, engineers, planners, museum curators, writers, performers, musicians and other creative makers. Ongoing creative partnerships include: socially engaged interventions through the ‘Edible Construction Company’; public art works through ‘Site Insite’; and the fictional record company ‘Obstacle Soup. 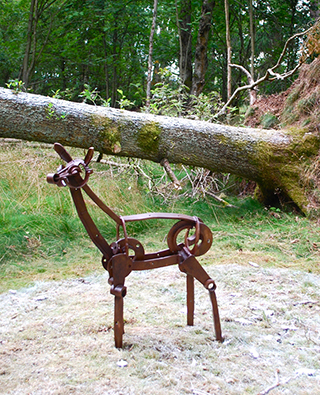 A deer – constructed of recycled bronze metal from old whisky distillery equipment – stands beside a fallen mature oak tree, blown down during the savage gales encountered in the Monkquell woods in 2012/2013. During the winter, roe deer are frequent visitors to this woodland located close to residential houses, looking for food and shelter. However, last year the winter was once again prolonged, and the deer could be seen more often than previously.This deer is alone, having been separated from the others. It is on edge, head turned and ears pricked alert to the slightest sound. The ground and the trunk of the oak tree is dusted white. Unexpected snow in September. Is our climate indeed changing? How does wildlife cope? How do we cope? 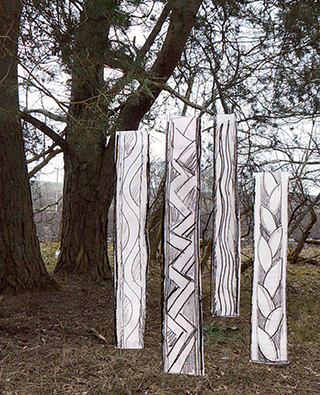 Based in Perthshire, Hong Kong-born artist Fanny Lam Christie is a sculpture graduate from Edinburgh College of Art. Her practice includes public art projects, sculpture commissions and exhibitions. Her installation work explores our relationship with nature and ecological concerns. Kevin has won several awards for his sculptures including a major award from the prestigious Pollock-Krasner Foundation in New York. Recently he had a solo exhibition at the Shetland Museum and Archives and in July this year his work was selected for the 7th Figurative Painting and Sculpture competition organised by the Museum of Modern Art in Barcelona. He currently lives in Edinburgh and lectures part-time at Edinburgh College of Art. 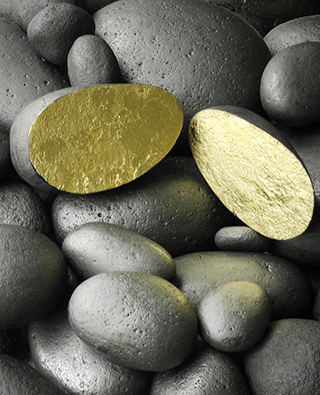 Lodestones – pieces of magnetite rock – used as compasses by early navigators. The urge to journey is universal. The call of the North in spring and South in the winter is an irresistible force for migratory birds. Exactly how they navigate still remains a mystery but studies show that an important factor is their ability to perceive the Earth’s magnetic field. Navigating by internal compasses seasonal travel is the lodestone of their existence. Guided by the geomagnetic field deep within the earth’s core, for them the sky owns no frontiers. ‘Lodestones’ is a reflection on such freedom. A graduate of fine art Kyra Clegg’s practice includes sculpture, video, installation and mixed media. Solo exhibitions have included work on the theme of habitation and memory. She has an ongoing interest in developing work which responds to and is inspired by specific locations. Based in Fife she exhibits nationally and internationally. Visiting the disaster areas in Fukushima Japan during a 10 week residency in 2013 was the catalyst for thoughts about natural disasters, the relationship between Man’s actions and consequent environmental responses and of the need for personal refuge and safety at times of extreme and unexpected situations. In the Fukushima earthquake, tsunami and subsequent nuclear accident the meticulous planning for personal safety was found to be entirely inadequate for the forces of nature. This alien Heartwood ‘Refuge’, like a hide, offers a sanctuary but no protection. 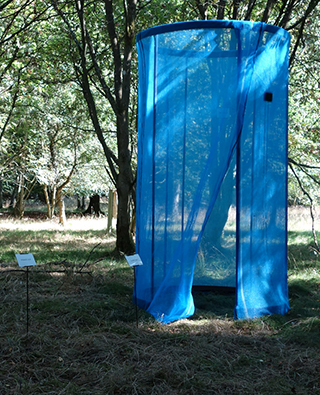 It gives a new view of the woodland and invites contemplation on our relationship with the natural world around us.This work continues a practice in which the artist looks at and questions social aspects of land and landscape. Many of her projects are currently showing in the exhibition ‘Intersections’ at Threshold artspace at Perth Concert Hall until 30th November 2013. Su Grierson graduated Master of Fine Art from Glasgow School of Art in 1995 having previously received a BA (hons) first class at Duncan of Jordanstone College of Art in Dundee. Since graduation her exhibitions and residencies have been in the UK, Australia, New Zealand, Sweden, Finland, Estonia, Denmark, Japan and Lithuania, mainly creating installations of video and sound with digital images as well as installations within natural environments and venues. Responding to the dynamic and intricate ecology of the forest canopy and the quality of the light that passes through it, Hannah Imlach has created a new site-specific sculpture.Suspended as a temporary canopy within a small clearing of trees, the ‘Forest Canopy Lens’ acts as a visual filter, allowing aspects of the environment above to be viewed from new and altered perspectives. The honeycomb structure of clear and magnifying components provides a myriad of viewpoints constantly shifting with changes in light and wind. Projected hexagons of light and shade are cast upon the forest floor. Through the creation of works of this nature Hannah hopes to heighten our awareness and appreciation of often overlooked aspects of our environment. 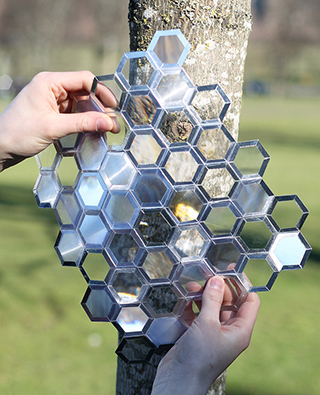 Hannah Imlach is a young Scottish artist passionate about forging new creative ways to engage with our environment. Since graduating from Duncan of Jordanstone College of Art & Design in 2011, Hannah has undertaken a number of exhibitions and residency opportunities across Scotland. Most recently Hannah completed a research residency in Dunbar with North Light Arts ‘Walking a Line’ project and hopes to exhibit the resulting work later this year. Hannah’s work will also be on show in the Edinburgh Art Festival Travelling Gallery exhibition ‘This Land’, which will be touring Scotland until December. Aspects of nature and the wider landscape inspire Susheila’s work. Her sculptures are organic in character, sensuous and powerful – like nature itself. ‘Inner Strength’ explores and reveals the heartwood of oak. This work reflects the basic elements needed for growth – air, earth and water. The sculptures suggest /allude to ideas of sap rising and stored energy that is present in trees, and the quirky character of the tree trunks suggest an element of playfulness/wilfulness.When working with wood Susheila uses oak – a wood known for its strength and durability. Normally the sapwood is stripped off to leave the heartwood for carving. 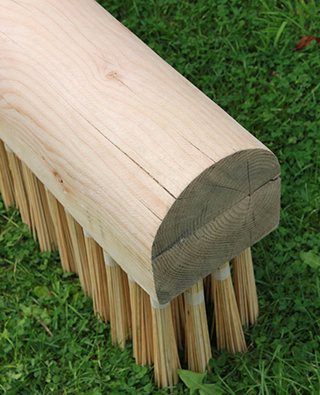 However these works celebrate all aspects of the tree – the bark, sap wood and heartwood. Susheila is a professional sculptor primarily carving stone and wood. Her work has been shown in group and solo shows. She works to commission, sell sculptures privately and has been involved in public art projects. As well as creating her own work, she also works as an arts educator, working with communities and schools to develop more specialised art/sculpture projects. Susheila is a graduate of Edinburgh College of Art. Before studying art, she completed an MA in Psychology at St Andrews University, and followed this with several years travelling and working abroad, including a year in India and two and a half years in Egypt teaching English. You are invited to explore and interact within Shona’s imaginary, enhanced landscape. By approaching this landscape from your own perspective, you can interact with the work to form your own narrative.You may trample around ‘The Treadmill’, gaze into the ‘Pool of Reflection’ or you might like to manoeuvre the ‘Stepping Stones’. Perhaps you’ll take a leap into the ‘Field of Balance’, and meander through the ‘Gardens of Fulfilment’, absorbing the beauty and simplicity of nature. You might find these areas in any order and, whichever pathway you create, it will echo someone’s life journey and will offer new or remembered analogies for the human condition. Shona Leitch lives and works in Perthshire. She gained a BA(hons) from Grays School of Art, Aberdeen and has exhibited internationally. In recent years she has been exploring the sculptural potential of materials such as lime mortar and this has led her practice to expand from ceramic sculpture to site specific sculptures and installations. Shona also runs regular classes and workshops in ceramics and figurative sculpture. 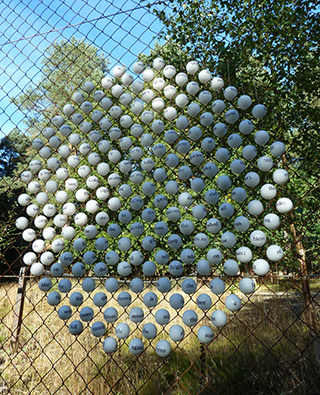 With lines borrowed from well-known poems celebrating nature and summer, Martine has created a playful installation on the tennis court fence. Visitors are invited to spin the table tennis balls she has woven into the mesh, each one displaying two words from the original poems, to reveal new poetry that can be read in any direction.This game is inspired by Dada and other movements who purposefully altered existing texts to bring out new and exciting juxtapositions. After graduating in Sculpture at Edinburgh College of Art in 2006, Martine went on to complete the MA in Contemporary Art Theory and the MPhil in Visual Culture. Based in Edinburgh, she writes for ‘Art in Healthcare’ and recently did a residency with Forest Centre. She also co-organises ‘7@7’, a series of regular group crits for artists. Duncan has, over the past few years, been interested in art which gets the viewer to interact, not only with the work, but also with nature. Through the action of taking seeds to the ‘hand feeders’ placed strategically though the wood, the participants will engage with the environment and might also reflect on man’s relationship with wild life. 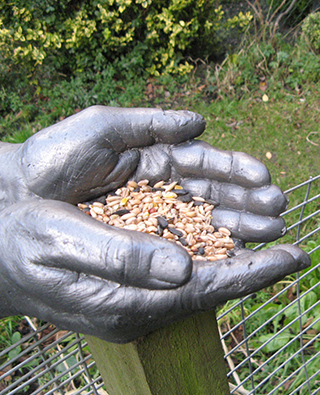 The hands are casts of Duncan’s own hands, but he wants them to be seen as universal symbols of man giving back to nature. Originally from Perthshire, Duncan Robertson studied sculpture at Edinburgh College of Art. He studied under Eduardo Paolozzi in Munich and is now based in Edinburgh where he has a studio in Edinburgh Sculpture Workshop. He practices in a variety of mediums from bronze to photography, often choosing casting as a technique. His works aspire to provoke an emotional response from the viewers. A site-specific installation using naturally shaped and hollowed pieces of elm and bamboo that have reached the end of their life spans. The hollows inside certain elms occur as part of the ageing process, with the natural functions of life being supported by the outer perimeter of the trunk. This work is an exploration of the cycle of life, the creativity and resilience of nature, and the beauty of transience. 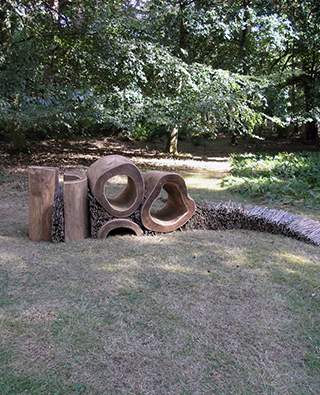 Nigel Ross is an artist who works in wood to create large abstract sculpture and sculptural seating which attempt to harness the energy and strength of the tree. His wood sculpting was a natural progression from years working as a tree surgeon and a forestry contractor. Landscape and nature and early pre-history are major influences and many of his commissions are in outdoor settings across Britain. Fallen trees are often carved on site to create a harmonic presence with the natural surroundings.His seating is frequently used to add an organic aspect to new public buildings and urban spaces, and also exists in many private collections both in the UK and abroad. Public commissions include Canary Wharf, London and Stoke 6th Form College and the Royal Devon & Exeter Hospital. Nigel Ross lives and works in Perthshire. 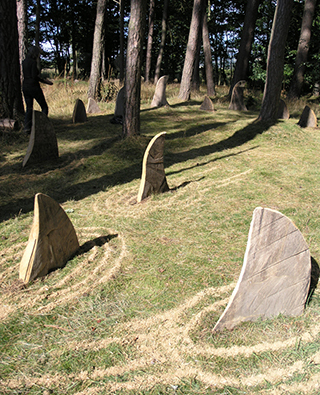 Ancient woodlands and rainforests are decreasing at an alarming rate due to the destructive power of man for short-sighted reasons.The ‘Woodland Sharks’ symbolise man’s predatory-like behaviour towards nature and his circling in on endangered territory. Ironically they are also representative of predator becoming prey, the kings of the ocean are being pushed further and further towards their irreversible extinction. Sharks are hunted down especially for their fins while rainforests are logged down ruthlessly. This destruction of nature not only leads to the loss of valuable resources but also to the decline of species diversity. Claudia Wegner is a painter who also works in sculptural ceramics and other materials such as wood or anything to be recycled. Very often she works around themes that convey her concerns with environmental issues and the glorification of war. Born in Austria, she is now based in Perthshire where she has been working for more than ten years. She was trained in Austria and Germany and exhibits in Europe as well as Scotland.